In a move clearly orchestrated by (or at least for) stan Twitter, Robert Pattinson has joined in Netflix’s David Michod–directed drama The King. 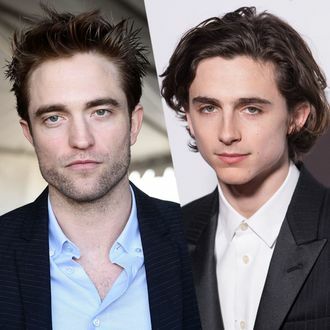 According to The Hollywood Reporter, Pattinson, Sean Harris, Ben Mendelsohn, and Lily-Rose Depp will appear alongside Timothée Chalamet in the period drama. Based on Shakespeare’s Henry the IV and V, Chalamet will play the young King Hal who “inherits the crown and must learn what it means to be a king, guided by his one true friend, Falstaff.” Joel Edgerton plays Falstaff. As for the others: Pattinson will play French Duke “The Dauphin,” Mendelsohn is King Henry IV; Depp is Princess Catherine, Hal’s betrothed. Timmy will feud with Rob Pattinson and have daddy issues with Ben Mendelsohn? We are not ready. Stream The King in 2019.